The family of a nine-month-old girl who died after an incident at a nursery have paid tribute to her. 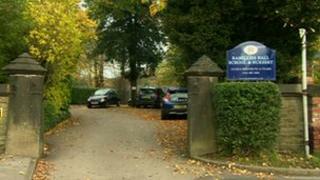 Millie Thompson died after she became ill at Ramillies Hall School and Nursery in Cheadle Hulme last Tuesday. Police were called to reports of a child choking on food and she was taken to hospital but could not be saved. Her family paid tribute to their "much loved and cherished beautiful daughter" as the inquest into her death was opened by the South Manchester coroner. They added: "As a family we are struggling to come to terms with this devastating news." The inquest into her death has been adjourned while investigations are carried out. Det Insp Matt Hope, of Stockport CID, said: "A comprehensive investigation has commenced and we will review every aspect of this tragic event so that we, and the family, can eventually understand what happened. "Our thoughts are with the family, and they remain at the forefront of everything we do, as we try to piece together the precise sequence of events which led to the death of their daughter. "A detailed report will be submitted to HM Coroner once the investigation is complete."